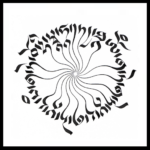 Described by Dzongsar Khyentse Rinpoche as "the head, heart, soul and spine of Mahayana Buddhism," the Heart Sutra is perhaps the most popular Buddhist text in East Asia. Rinpoche suggests it is auspicious to chant the Heart Sutra daily, especially while studying Madhyamaka. This is perhaps the most famous praise of Mañjushri recited by Tibetan Buddhists. According to legend it was composed by 500 Indian panditas simultaneously, in response to a request from their abbot, after whom it takes its formal name Shri Jñana Gunaphala, "Glorious Wisdom's Excellent Qualities". It is the chief clarification of words. It is the nondual reality. Therefore, all sentient beings should definitely study and recite the Mañjushri-Nama-Samgiti. This is praised as being the root of all the tantras. It is like a Buddhist Bhagavad Gita. As I read, you should pray to be born as Mañjushri’s assistant, as his disciple, when he attains enlightenment. He is supposedly the last buddha that will be enlightened during this kalpa. It is also said that he was the first buddha of this kalpa. In composing Wisdom's Bestowal, Jamyang Khyentse Wangpo relied upon and adapted the writings of the great Sakya masters Jetsün Drakpa Gyaltsen and Sakya Pandita. Artwork (top to bottom): "Emanate from Emptiness" by ➜Tashi Mannox; Mañjushri, 14th century, Sakya lineage, Tibet. Collection of Rubin Museum of Art ➜Himalayan Art; Mañjushri-Nama-Samgiti, 16th century, Kagyu lineage, Tibet, Collection of Rubin Museum of Art ➜Himalayan Art; Mañjushri-Nama-Samgiti, 19th century, Tibet, Collection of Rubin Museum of Art ➜Himalayan Art.